Kylie Franson is a very busy woman who holds many varied and important roles. Kylie is the mother of two young boys, Jacob and Mitchell, and is married to Kyle. Kylie also runs her own business ‘No Limb-its’ and is the founder of the South Australian charity ‘Kidney Kids SA’. Kylie, who is 33 years old, was also born with a congenital upper limb difference. “I was born missing my left forearm, and to this date I don’t know what caused my difference,” Kylie explained. Reflecting on her childhood, Kylie feels that her limb difference didn’t present many difficulties while growing up. Although in adulthood Kylie has had some corrective surgery, to improve elbow joint movement, and thinks that not using a functional prosthetic arm may have contributed to some more recent physical difficulties. “The prosthetics available in the 1980s were not as advanced as they are today, so I was initially fitted with a heavy arm with a ‘metal hook’ hand when I was 10 months old. I never really took to it, had falls and consequently I would rarely wear it. If I was a child today, with the better options now available, I think I would have persevered with a prosthetic arm,” Kylie said. At the age of 10 Kylie was fitted with a cosmetic arm (cosmesis), with no functionality and a primary purpose of ‘filling out’ clothing. Kylie didn’t wear her cosmetic arm for very long as, like the functional prosthetic arm, she found it “got in the way of things and I operated better without it”. As an adult, however, Kylie has started to experience some back issues that she attributes to not wearing a prosthetic arm. “I overused my residual limb and have put excessive force on parts of my back because of not wearing a prosthesis. As a result, I can’t perform some everyday tasks, such as vacuuming, without pain. I wish that I had persevered with a prosthesis when I was a child, or that today’s ones were available then, as I’ve not been able to adjust and wear one as an adult,” Kylie explained. Born in Adelaide, Kylie moved to the small country town Wallaroo when she was a child and stayed there until recent years. Prior to moving to Wallaroo, in Grade 6, Kylie’s Mum contacted the school so that staff and students could be prepared about her limb difference. “My Mum did the right thing letting the school know that I was missing my arm, but as no one had met or encountered an amputee previously they didn’t know what to expect. Maybe they thought a green monster was coming to school, so it came as a shock when I arrived and the students just started saying ‘nice to meet you, but you’re normal and we thought you’d be different’,” Kylie recounted. Naturally fellow students asked questions about why Kylie’s arm was missing, to which she responded “I was born this way” and with curiosity sated the matter was no longer discussed. Kylie was, well, just ‘the new kid at school’. Over the course of her childhood Kylie did come across a handful of negative comments regarding her limb difference. “In primary school I wanted to do calisthenics and when I joined the group we all had to get in a circle and join hands. Well, the poor girl next to me freaked out that she would have to hold hands with someone without one. While it was a little distressing at the time it was one of those experiences that helped me to build resilience, so I treat it as a positive experience,” Kylie said. Kylie recognises that “you can’t stop the way people feel but you can change the way you respond to people who are inappropriate, and it’s useful to use humour and information as influential tools when it occurs”. Kylie’s family didn’t treat her any differently to her younger brother and supported her to be “open, honest and assertive” and she was reluctant to let her parents interfere when she encountered any trying situations. Kylie feels that this played a significant role in her building personal resilience and self-confidence. Kylie’s open approach to discussing her limb difference, along with a desire to positively educate others, led to her conducting presentations at her sons’ primary school in recent years. “I realised that teachers and students were wondering why I had a missing arm and what it’s like to live life without use of two arms, so I asked the school whether it would be useful to make student presentations,” Kylie said. Over the last few years Kylie has conducted many information sessions to students. Kylie outlined that “it has helped my sons who have not had to repeat the same story about their Mum each year, and it has also allowed me to educate students about limb difference, as well as have great fun talking to curious children”. 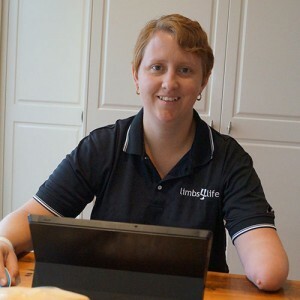 After receiving positive feedback from educators and a push from them to conduct similar presentations in other schools, Kylie developed her business ‘No Limb-its’ during 2015. Kylie has structured her presentations, with the assistance of her step-mother and best friend who are both teachers, so that they align with the National Curriculum for Education requirements in ‘health and physical education’ and ‘civics and citizenship’ at both primary and secondary levels. Kylie uses these presentations to share her life experiences, brings props (upper and lower-limb prosthetics and adapted assistive devices), and discusses what it’s like to live with a physical disability. More importantly, Kylie’s key focus and message is that being a person with a limb difference presents ‘No Limb-its’ to her. Kylie’s presentations are age-appropriate and suited to the curriculum being studied by the students. The most frequent question posed by students is “why don’t you have an arm?” For older students the response is generally a detailed explanation, along with medical information, about the common causes of limb differences. For younger students the most appropriate and acceptable answer is generally “I came out of my Mum’s tummy with only one arm”. Many students, and particularly those in secondary school, “want to talk about my personal experiences and disability more generally as it is something they are becoming more aware of and relates to their studies”. Consequently Kylie has developed a program that incorporates information about health and wellbeing, ethics, equality, respect, fairness and establishing positive social skills when supporting members of the community who live with disability. Kylie has a growing bank of hilarious questions and responses to her presentations, particularly during encounters with young children. One eight-year old girl asked a question both funny and borne out of serious concern. “At the conclusion of my talk, this little girl asked me whether my Mum had been to a doctor recently to have an x-ray to make sure that my arm wasn’t still stuck in her tummy. She was genuinely worried about my Mum, but I was able to allay her fears by further explaining that my arm didn’t grow so it hadn’t ‘been left behind’ inside my Mum,” Kylie laughed. Another student approached Kylie at the end of the school day, presenting her with a cut-to-size ‘hand’ made out of blue paper. Kylie recalled that this girl said “I know you have that arm thing going on – so here’s a hand for you, I hope it helps”. Kylie is amazed by the honesty, empathy and understanding of all the students she has encountered, and hopes that they go home to share their learnings and build positive awareness of limb difference and disability with their families. Kylie’s experience with disability extends to her immediate family also; with her oldest son Mitchell living with Autism and younger son Jacob living with kidney disease. Jacob was born with a chronic kidney disease which requires ongoing assessment and treatments. This experience and meeting families in a similar situation led Kylie to establish the ‘Kidney Kids SA’ charity in 2012. “During Jacob’s early life we were living in regional South Australia and travelling over 300kms roundtrip on a regular basis to attend the paediatric hospital renal clinic in Adelaide. I saw first-hand how hard it is for rural families who sometimes have to leave home and spend weeks or months at a time in Adelaide. It is a draining and expensive experience for these families, with little financial and other assistance available to them,” Kylie explained. Kylie, along with some friends, decided that something could be done to support families in these circumstances. “We launched Kidney Kids SA so that families in South Australia could apply for financial assistance. We are a volunteer-only run organisation that fundraises and attracts sponsorship to support the families of children with kidney disease,” Kylie stated. Kidney Kids provides families with travel assistance, accommodation funding, hospital meal vouchers and other support to make their stay in hospital more comfortable and less stressful. “I can’t thank our Committee Members, volunteers and sponsors enough for making Kidney Kids a reality. It’s hard enough having a sick child, but when you also have financial concerns the situation can be overwhelming. So, it’s great we can play a small part in making things a little easier for Kidney Kids families,” Kylie emphasised. Kylie has recently began using the National Disability Insurance Scheme (NDIS) to obtain support for Mitchell. “As a new program it hasn’t been without some issues, but it’s improving as the NDIS becomes more settled and stabilised,” Kylie said. “The biggest learning I have had, and would say to any parent, is make sure you are prepared to advocate for your child and be across what his or her current and future needs might be. I would also suggest that you use the skills of allied healthcare professionals that you respect. These professionals will be of enormous assistance when it comes to planning, advocacy, helping you to navigate the system and completing the reports that NDIS require,” Kylie highlighted. Having looked over the ‘Limbs 4 Kids NDIS Parent Checklist’, Kylie thinks this will be a valuable tool for parents of children with limb difference preparing to enter into the scheme. Kylie is a keen advocate for Limbs 4 Life and our Limbs 4 Kids program, and has been formally trained as a Peer Support Volunteer. “Until I came across Limbs 4 Life many years ago, I didn’t know of any specific support for amputees in Australia. But since then I feel like I have joined a community where people can connect and share experiences,” Kylie stated. “I’m also really passionate about the Limbs 4 Kids program, and want to be able to support families to feel less worried about their child’s future and show them a ‘normal, everyday Mum’ who has had a limb difference since birth,” Kylie expressed. In drawing upon her personal and professional experiences, Kylie wanted to share some thoughts and tips with readers. Kylie wanted readers to remember that children are curious, may not have met someone with limb difference, and thus sometimes say inappropriate things. Kylie highlighted that “generally this is because of a lack of understanding, rather than a desire to hurt your child’s feelings”. Kylie also suggested that it is a good idea for children to prepare their own limb difference story, but ensure that their other interests or skills form part of that narrative “as that way their limb difference doesn’t become the key focus of their identity”. Limbs 4 Life thanks Kylie for taking the time to be interviewed and sharing her story in Thrive.